Sending and receiving beautiful cards is one of my favorite holiday activities. The 2013 Minted Christmas Card designs have just been released; and they asked me, as a part of a sponsored post, to look them over and share if I like what I saw. And I did like the fun and modern look of the collection. I especially love that they can make them with my (or your) favorite photos for just that special touch during the holidays. I am receiving products in exchange for my opinions. I try very hard to blog with integrity and will always share my honest thoughts with you!!! I am not usually a fan of those ‘Year in Review’ lengthy letters from friends and family. But I really am taken with the Infographic sytle Family Year in Review by j.bartyn. It is a fun change from the norm and offers the recipient a quick, easy to read way to share the year. I might just send one of these this year…it has been one of remarkable and life-changing events for HIMself and I. For those who prefer to let their photos do the talking, the Quilted card by Griffinbell Paper Co. is perfect. Just look at those sweet faces on the NOEL card below. This one illustrates your year without words, yet it says so much. After all a picture is worth a thousand words. If you are like me and can’t make up your mind which one photo to share, the Rustic Pine Minibook™ card by Carolyn MacLaren solves that problem. The unique Minibook card has seven pages of fully customizable photos and text…more room to share with friends and family. The 5X7 Minibook cards don’t require extra postage. You really can’t beat that. 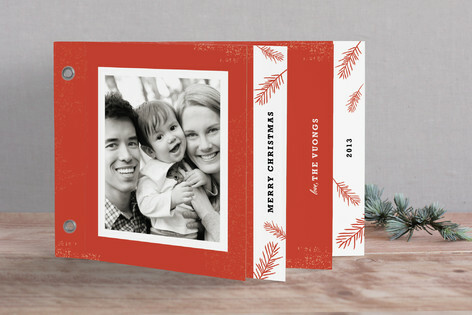 Minted also offers photo ornaments in lovely shapes and sizes. 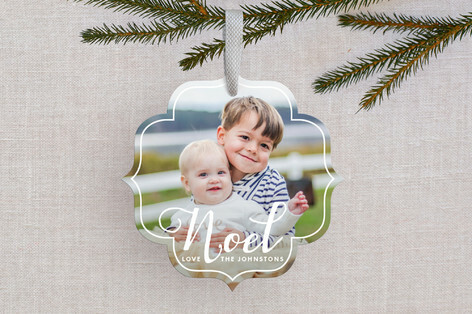 The White Noel by Hooray Creative is a festive keepsake ornament card that friends and family will cherish. Each card includes a pre-cut luxe linen ribbon to hang the ornament or attach to a gift. 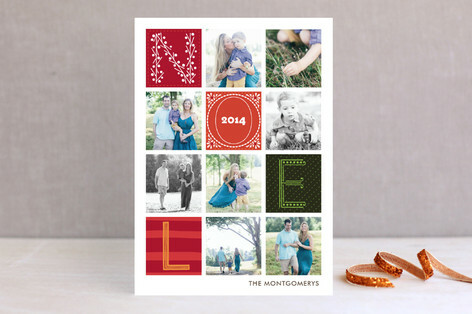 If you want to include your best 2013 photos in your Christmas greetings, visit Minted today. They have many more designs for you too play with. There are pages of unique cards by talented, world-class designers for you to browse. One is sure to be perfect for you and your loved ones!